Food magically tastes so much better after one or five drinks, am I right? This theory works especially well if the food is greasy and/or cheesy. Downtown Las Vegas has loads of food options, but we found the top three best late-night spots to check out after your trip with Vegas Pub Crawler. These restaurants are good when you’re sober and better when you’re drunk. Detroit has been home to American Coney Island for almost 100 years. Finally, Las Vegas earned access to the beautiful chili dogs they serve. Stumble to The D Las Vegas after your pub crawl, and you’ll find chili dogs, french fries, gyros, and more American favorites served 24 hours a day! For the first time, American Coney Island founded a location outside of Michigan. Take advantage of this Detroit specialty without having to brave Michigan snow. Open until 11 Monday-Wednesday, midnight on Thursdays, and 2AM on Fridays and Saturdays, Flippin’ Good Burgers and Shakes is the place that will please all of your friends. The burgers are gigantic. 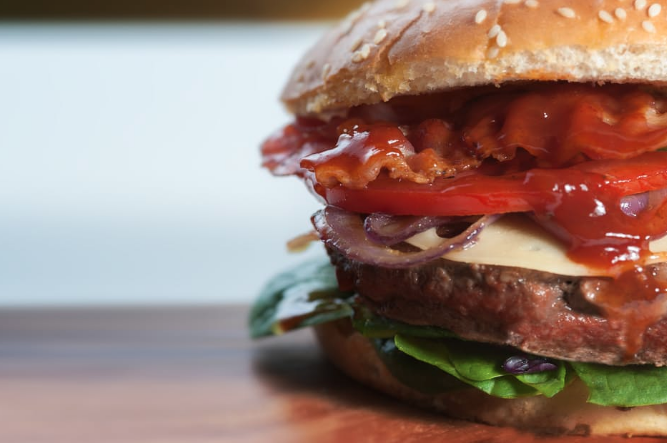 You have an options for burgers made with beef, chicken, turkey, or veggies, along with an endless supply of toppings. Fries, onion rings, and chili also pair well with a drunken night and a burger. To complete the drunken trifecta, we have pizza! Open late every night, Pizza Rock at Downtown Grand offers a full menu of Italian food options. Also, if you haven’t yet reached your drunken pub crawl potential, they have a full menu of specialty cocktails. If your picky friends couldn’t find what they wanted at Flippin’ Good Burgers and Shakes, there’s no way you’ll fail at Pizza Rock. Salads, pasta, burgers, pizza, desserts, and more will please everyone in your group during your DTLV visit. Let us deliver you to the restaurant of your choice! Schedule your specialty pub crawl today. We’ll take you from bar to bar and give you our personal drink and food suggestions as we go!